Gupta currently serves as founding director of the Halıcıoğlu Data Science Institute at UC San Diego. His research is in embedded and cyber-physical systems with a focus on sensor data organization and its use in optimization and analytics. He has led several large scale projects including NSF Expeditions on Variability and DARPA projects under Data Intensive Systems (DIS) and Circuit Realization at Faster Timescales (CRAFT) programs. He also leads NSF project MetroInsight and a co-PI on DARPA/SRC Center on Computing on Network Infrastructure (CONIX) with the goal to build new generation of distributed cyber-physical systems that use city-scale sensing data for improved services and autonomy. His past contributions include SystemC modeling and SPARK parallelizing high-level synthesis, both of which have been incorporated into industrial practice. Among recent recognition of Gupta’s work is a best demonstration paper award at ACM BuildSys’16. He has served as EIC of IEEE Design & Test of Computers and founding EIC of IEEE Embedded Systems Letters. He currently serves as Editor-in-chief of IEEE Transactions on Computer-Aided Design of Integrated Circuits and Systems. Gupta received a bachelor of technology in electrical engineering from IIT Kanpur, India; a master of science in EECS from University of California, Berkeley; and a Ph.D. in electrical engineering from Stanford University. 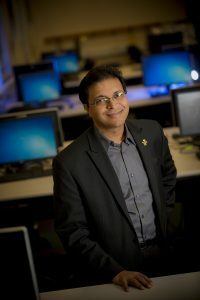 Earlier he worked at Intel Corporation, Santa Clara and on the computer science faculty at University of Illinois, Urbana-Champaign and UC Irvine. Gupta holds the Qualcomm Endowed Chair in Embedded Microsystems at UC San Diego and INRIA International Chair at the French international research institute in Rennes, Bretagne Atlantique. He is a Fellow of the IEEE, the ACM and American Association for the Advancement of Science (AAAS). The McDowell Award is given to individuals for outstanding recent theoretical, design, educational, practical, or other innovative contributions in the field of computing. The award may be given for a single contribution of great merit or a series of lesser contributions that have had or are expected to have an important influence on the computer field. The award consists of a bronze medal and a $2,000 honorarium. The award will be presented at the awards dinner held on Wednesday evening, 5 June 2019 at the Hyatt Regency Coral Gables, Florida during the IEEE Computer Society Board of Governors meeting. One of computing’s most prestigious individual honors, the W. Wallace McDowell Award has a list of past winners that reads like a who’s who of industry leaders. They include FORTRAN creator John W. Backus (1967); supercomputer pioneers Seymour Cray (1968), Gene Amdahl (1976), and Ken Kennedy (1995); the architect of IBM’s mainframe computer Frederick Brooks (1970); Intel Corp. co-founder Gordon Moore (1978); COBOL creator Grace Murray Hopper (1979); Donald Knuth, the father of algorithm analysis (1980); microprocessor inventor Federico Fagin (1994); World Wide Web inventor Tim Berners-Lee (1996); Lotus Notes creator and Microsoft Chief Software Architect Ray Ozzie (2000); and IBM Fellow Ronald Fagin (2012). Learn more about the W. Wallace McDowell Award, including a complete list of past recipients.